WMI Provider Host WmiPrvSE is a Windows Host Management Process that is used by the Developers for Monitoring Purposes. This behavior is usually seen on Production Environment After upgrading Windows 7 to 10 many of the users have noticed spike in CPU usage which makes the system lag, hot and slow. My personal guess is that the issue is caused by an unusual behavior of this service not following the patterns it is supposed to. To fix this issue we will run some basic command on the command prompt and restart the Windows Management Instrumentation Service. Download and run Reimage Plus to scan, repair and restore corrupt and missing files from here, and then see if the usage by the process WmiPrvSE drops. If not, try the other listed solutions below. From the services console; locate the Windows Management Instrumentation Service, What i usually do is click on any of the service and then press the W key to get to the services starting with the Word W. Then do a quick scan to locate the one i want. Now choose Restart to restart the service. You can also stop the service from here if you want but it is not recommended. So let it run and we’ll fix the High CPU Usage issue with this process. Once this is done, hover over your mouse to the bottom left corner onto the Start Button and do a (Right-Click) on it. 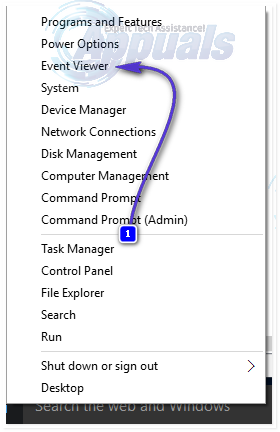 A Contextual menu will open; choose Command Prompt (Admin) from here. 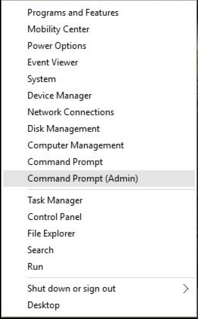 In the command prompt window that opens up; type the following commands one by one; after each command press the Enter key. Once done; Reboot your PC and check. This should allow the process to drop significantly and the CPU will be back to its normal use. If not, proceed to the next method below. Open the Event Viewer. 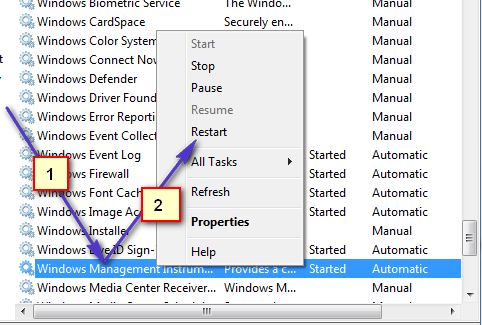 If you are using Windows 7 or earlier, search for Event Viewer in the Start Menu and then open it. If you are using Windows 8/8.1 or 10, simply press Windows Logo key + X to open the WinX Menu and then click on Event Viewer in the WinX Menu. 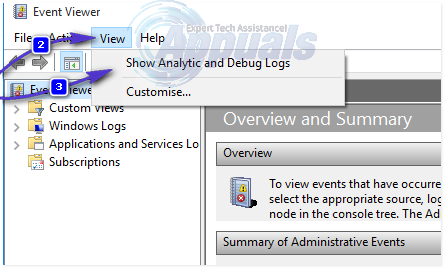 Click on View in the toolbar at the top of the Event Viewer window and enable the Show Analytic and Debug Logs option. In the left pane of the window, navigate to Applications and Services Logs > Microsoft > Windows > WMI-Activity. 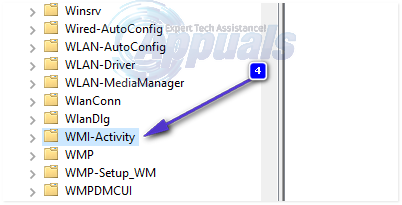 Double-click on WMI-Activity to expand its contents, and click on Operational in the list of its contents to open the WMI Provider Host’s operational logs. Look for any errors, and when you find one, click on it to display its specifications at the bottom of the window. 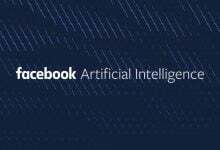 Under the General tab of the specifications of the error you clicked on, look for the term ClientProcessId, and when you find it, note down or remember the number(s) – 1079, for example – that follow it. Close the Event Viewer and open the Task Manager. 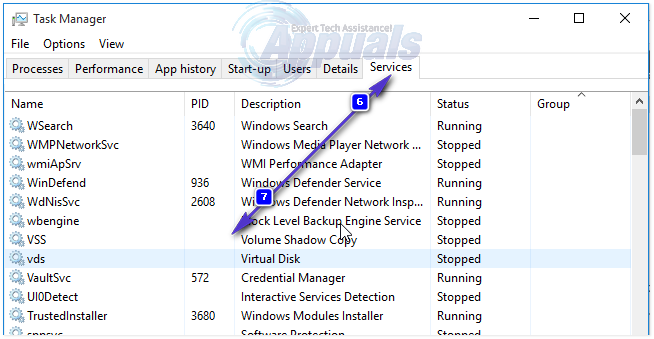 Hold the Windows Key and Press R. In the Run Dialog, type taskmgr and click OK. Navigate to the Services tab and look for the service that has the same Process ID (PID) as the number(s) that followed the ClientProcessID term. 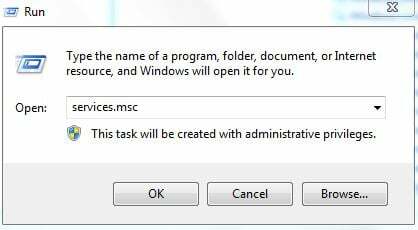 The service that has the corresponding Process ID is the culprit, so once you find it, immediately disable it and then go to Control Panel > Programs & Features and uninstall the program that the culprit service was for. Once the program has been uninstalled, WMI Provider Host should go back to using an extremely minimal amount of CPU.